My book club read this John Irving novel in January, and – for me at least – it was a great start to a new year of reading. Some books become favorites of mine due to a great, innovative or twisting plot (like last year’s Two on a Tower), some others due to a setting unlike I’ve encountered before (perhaps like The Hunger Games trilogy), and some are endearing because of a great character or characters. I would put last year’s reading of The Millenium Trilogy in this last category, with it’s refreshingly unique (anti-?) heroine, Lisbeth Salander. And now, one of my new favorite literary characters is Owen Meany. Owen Meany is an unlikely hero. A child of somewhat strange and reclusive parents, he was born with some sort of defect in his larynx, which rendered his voice into something not quite human-sounding. He also suffered from stunted growth – even as an adult never growing to five feet tall. It’s remarkable that he is able to overcome these “handicaps,” but he does- seemingly almost with ease. Irving starts out the novel with the narrator saying in the first paragraph that Meany “is the reason I believe in God.” That’s a pretty good hook to get one reading the rest of a book isn’t it? And if that’s not enough, in the SAME SENTENCE we also learn from the narrator that Meany “was the instrument of my mother’s death.” That’s enough to keep one reading too, I think. The novel is also a story of the friendship between Owen and his classmate Johnny Wheelwright. Their friendship is an unlikely one. Johnny comes from a privileged family; Owen does not. Johnny is physically “normal” (if there is such a thing) while Owen is not. Owen is a brilliant student; Johnny is not. (or as Owen put it, “YOU’RE MAINLY SLOW. YOU’RE ALMOST AS SMART AS I AM, BUT YOU NEED TWICE THE TIME.”) Oh yeah, I forgot to mention that Owen spoke in all capital letters throughout the book – it’s that unhuman voice, you see. Their friendship endures in spite of circumstances that would wreck most. Throughout everything, Owen is fiercely loyal to Johnny. The book made me think a lot about friendship, actually. It made me kind of regret never having that one, best friend that Owen and Johnny had in each other. It made me wonder what that must be like.. I heartily recommend this book. Has anyone else “out there” read this one. What did you think? What other Irving book would you recommend that I read next? This is a great, short book that can be read in an afternoon but revisited forever. 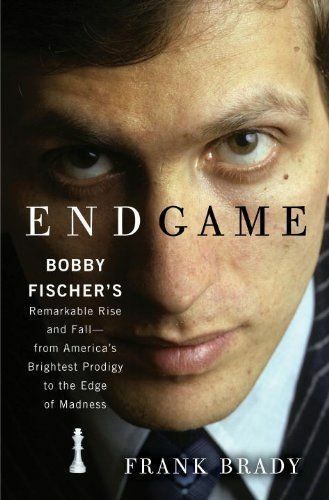 I think maybe it’s the uncomfortably close relationship between “genius” and “madness” that makes Fischer such a compelling figure. The history of chess is almost littered with tales of geniuses who “went mad” ostensibly due to their obsession with the game, or even the overworking of their brain in mastering its complexities. E.g., “Blindfold Chess” – where one player must keep track of the board and positioning of the pieces in his head vs. a sighted opponent – was “forbidden” for a long time in the former Soviet Union because it was felt to increase the risk of madness. Fischer, however, was the first celebrated case in this modern age of mass media, which may make him a kind of poster boy for the phenomenon. I can’t wait to read more about him. Supposedly, the book is very accessible to even non-chess players, so it may be worth a spot on your TBR lists.. Note, however, that his comments about the book lacking photographs and other supporting material only apply to his review copy, not the upcoming published version. It was January 29th, 1845 when this poem of unprecedented popularity was first published. Or so I learned when looking at the paper this morning during breakfast. I’ve read “most of Poe” over the years and have revisited this poem several times. 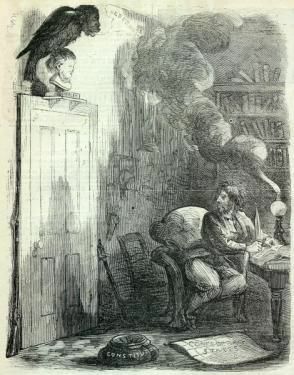 In October of 2009, for my book club’s annual “ghost story month,” we read a selection of works by Poe, including this one. A few of us also viewed a YouTube clip of Vincent Price’s famous recitation. It remains one of the most famous poems of all time. My first memories of the poem are of my dad reading it. When he was growing up, he was a huge fan of those ‘spooky’ radio programs, and I remember him imitating “The Shadow” and other creepy voices he grew up with. He was actually pretty good at scary voices and would often frighten my two brothers and me on our almost annual summer camping trips, telling ghost stories (more often than not beginning with “once upon a time, there were three little boys…”) until my youngest brother would get too scared and Mom would make him stop. My little brother’s lack of fortitude to endure these stories was a constant source of exasperation to my other brother and me. Recommendations for young (7 year-old) readers? … and I can’t wait to see what the other “tourists” on The Classics Circuit come up with. Three posts are scheduled for tomorrow, and a total of 26 posts over the next ten days. 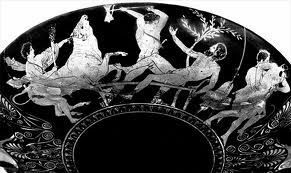 Tomorrow’s features are about Homer, The Odyssey, and Euripides’ Electra. Go to http://classics.rebeccareid.com/ to see the entire roster of upcoming posts. I’m looking forward to discovering some great new blogs (and bloggers) and revisiting a lot of works from the classic world that I haven’t pondered in years. Why not check it out yourself? 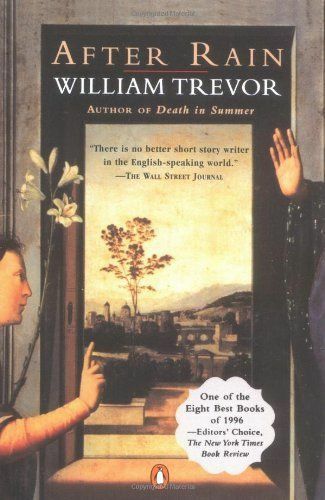 I’ve been slowly working my way through William Trevor’s short story collection, After Rain, for several months now. The title story of this collection is part of my “Deal Me In” short story reading project for 2011, but the other remaining stories are fair game for ad hoc reading whenever I have a spare half hour or so. 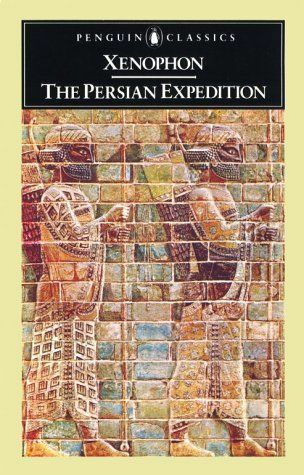 I had just such a half hour today, and I didn’t want to delve back into The Persian Expedition with Xenophon (mainly because I knew I wouldn’t want to return to the 21st century after “only” half an hour with my mercenary Greek hoplite friends…). So – I chose instead to knock out another William Trevor story. The story I read today was wonderful and chilling at the same time. It begins with the news that a young girl is murdered on the way home from work in South London. In the following pages we meet another resident of them neighborhood where this happens. She is Rosalie Mannion, a fifty year-old “single mother” who Trevor describes economically as having a “round, pretty face (that) had taken charge of what wrinkles had come, by chance distributing them favorably.” Isn’t that a great description? Anyway, what we then learn is that Rosalie has an adult son living with her who has always been a bit odd and troubled. We learn that he is antisocial and even spent a year once in an institution. His mother had hoped they “would keep him” but was assured by the haughty doctors that “as long as he stays on his medication, there’s nothing to worry about.” She knows they are wrong, and her life becomes a kind of private hell as he becomes wont to disappear for sometimes days at a time, during which she hears on the news of crimes or mischief where he has been. He mysteriously acquires a car, is absent from home and in a town where serious arson occurs, etc. etc. 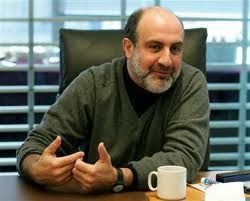 Yet seemingly he can also function rather normally in society and even holds down a job in an architect’s office. What makes this tale chilling is the gradual realization for the reader that “he knows that she knows” (or suspects) that he is evil. Worse yet, she knows that he knows that she knows, and even worse HE knows that… well, you get the picture. She’s too afraid to report him to the authorities – partly because he’s her son, but mostly because of her fear. The reader can imagine the fear and tension that this poor woman lives in day after day, and can sense that there is not likely to be an end to it. A disturbing but masterful short story. I read roughly the first 25% of this book this morning. 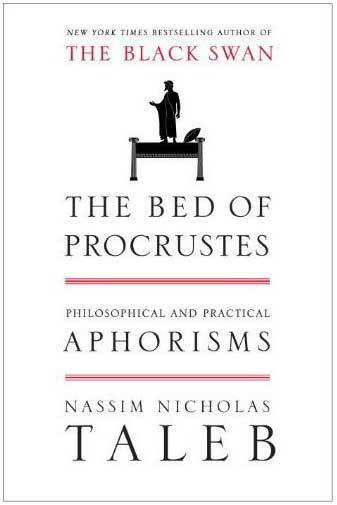 I’ve read at least parts of it before during my former life as a Classics Minor in college. I’m reading it now in preparation for a February 4th post on The Classics Circuit. 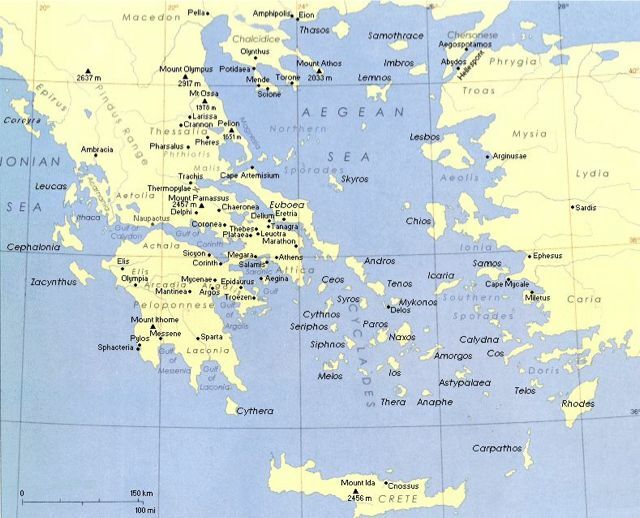 Also on the horizon is my reading and writing requirement about Xenophon’s Anabasis, which I have committed to writing a post about on February 4th. I’m anxious to get done with my A Prayer for Owen Meany reading so that I can really sink my teeth into this ancient classic. Oh well, (sigh)… Maybe this weekend will be a banner reading weekend for me. Maybe I’ll spend saturday morning “locked away” at one of the libraries downtown and catch up. What do you do when you find yourself veering off course in your reading routines? How do you get back on track? Okay, I have much more progress to report now. 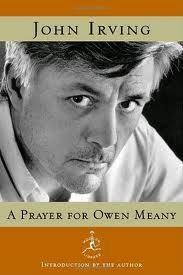 🙂 I am down to under one hundred pages to go in A Prayer for Owen Meany. I read quite a bit yesterday immediately after work and then before bedtime. I got up early this morning and kept reading (it’s too damn cold here for anything to seem more appealing than staying under the covers, warm and reading). I’m now on the final chapter – which is about 100 pages long(!) – and I have to admit I’m going to be sad when this book is over. I also drew another card this morning for my “Deal me in!” project. The ten of diamonds directs me to read Raymond Carver’s “Are These Actual Miles?” next. Diamonds is the suit of “mostly recommended by others,” which are all new to me stories. I couldn’t find the story available on line anywhere, and since I’m at the library this morning instead of at home (where my copy is), I guess I will have to wait until tonight to read it. I have to say I am really loving this project. The pace of just one short story per week allows and encourages me to spend more time focusing on just that story, rather than just “go on to the next one” as I used to do when reading collections or anthologies. I’m looking forward to reading Carver (recommended by fellow blogger Bellezza) as I have heard great things about him from several sources. Have you read any short stories in the young new year? Who are some of your favorite short story writers? If you’ve read my blog before, you’re probably already familiar with the fact that a Kurt Vonnegut Memorial Library has recently been opened here in Indianapolis. (A link to their website is on my blogroll if you’d like to check them out.) One interesting feature of their site is a blog that features a local writer’s journey through reading Vonnegut’s novels (in order of publication). Corey Dalton writes a new post for this “project” roughly once a month, and he’s up to Cat’s Cradle with his latest effort. The posts are deeper than most “reviews” one finds in the book blogging community, and I always learn a few additional things about Vonnegut’s books after revisiting the novels through his “take” on them. Highly recommended.